Representatives of the AGRITECHMURCIA platform, supported by the INFO, present in the II REGIONAL INVESTMENT Forum held in Panama the work developed by the agricultural technology companies of the Murcia region. The delegation of AgritechMurcia has just completed a prospective mission in the Central American country. Within the framework of the II Regional Investment Forum has presented the technological development and innovation carried out by Murcian agricultural technology companies for more than forty years, making known the work in collaboration with the public administration. Through meetings with representatives and entrepreneurs from different sectors and visits to different agricultural centers in the eastern region of Chiriquí, AgritechMurcia has explored opportunities for collaboration as a technological partner in the implementation of the Agricultural Master Plan of the Western Region of Panama. The project that aims to raise the quality of public services specialized in improving agricultural productivity. It will benefit some 15,000 organized producers and will be executed by the Panamanian Ministry of Agricultural Development (MIDA) in collaboration with the Competitiveness Center of the Western Region and supported by CAF Development Bank of Latin America and IICA Inter-American Institute of Cooperation for the Farming. 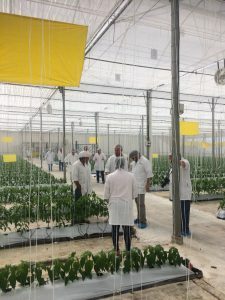 The mission of AgritechMurcia is the answer to the visit previously made by Panamanian representatives in Murcia, where they already knew the work, projects and experiences developed here by the companies AgritechMurcia. AgritechMurcia is a platform formed by agricultural technology companies that have more than 40 years of experience in the sector and have been able to adapt to the continuous demands of the market and the new agriculture. The work developed by our companies have positioned the Region of Murcia as a technological reference and agricultural producer worldwide. The result is that 20% of the fruit and vegetables that Spain exports to European markets come from the Region of Murcia, placing our farmers as world leaders in agricultural production and quality.